The U.S. Supreme Court has rejected the ELD appeal by the Owner-Operator Independent Drivers Association (OOIDA) and as expected, the ELD Mandate will be coming into effect on December 16, 2017. We understand that with so many unknowns surrounding how ELDs will impact your drivers experience, many trucking companies may be hesitant to adopt before the last second. However, with only 6 months left before the ELD Mandate comes into effect the time is now to come into compliance. 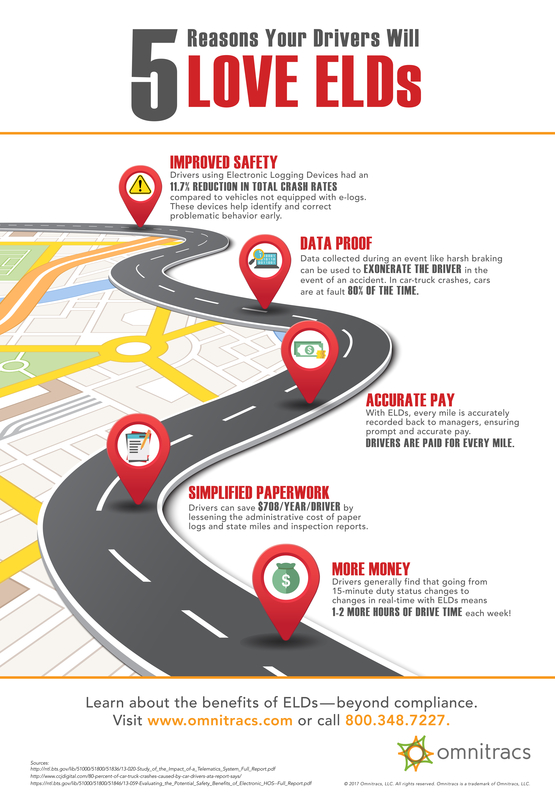 We have compiled the top 5 reasons why you and your drivers will love ELDs, from improved safety to simplified paperwork and more accurate pay. As an authorized reseller of the Omnitracs XRS platform we can assist you through your due diligence process inlcuding demos, official quotes and device procurement (mobile devices, data plans and mounts). Contact us today to get started!